Mitral stenosis is characterized by restriction of blood flow from the left atrium (LA) to the left ventricle (LV) as a result of a narrowed mitral passage. It is an acquired valvular defect; it is usually a consequence of rheumatic heart disease, though cases of congenital mitral stenosis are occasionally encountered. Extensive mitral annular calcification (MAC) may result in mitral stenosis, particularly in the aged. Mitral stenosis is seen more often in women than in men, and it generally develops at an earlier age in developing countries than in Western societies. In the latter, the incidence of rheumatic fever has declined precipitously over the past 4 decades. See the images below depicting mitral stenosis. Rheumatic mitral stenosis with commissural fusion and enlarged left atrium. Calcification of the subvalvular structures is minimal and has a low Massachusetts General Hospital (MGH) score; this condition is potentially amenable to balloon valvotomy. Patients with mitral stenosis usually remain symptom-free for years. After the mitral orifice is reduced to one third of its normal size, symptoms typical of left-sided heart failure develop, such as dyspnea on exertion, orthopnea, and paroxysmal nocturnal dyspnea. Right ventricular (RV) failure gradually ensues, causing ascites and edema. Multiple imaging modalities may be used to diagnose mitral stenosis. Echocardiography has become the most important diagnostic tool for confirming the diagnosis, for quantifying the severity of mitral stenosis, and for determining the optimal timing for intervention. Asymptomatic individuals with sinus rhythm on ECG need no treatment. After atrial fibrillation develops, pharmacologic agents may be administered to control the ventricular rate; in addition, anticoagulation therapy may be initiated to prevent thromboembolism. Symptoms of dyspnea and orthopnea improve with the use of diuretics. As symptoms worsen and pulmonary hypertension occurs, mechanical correction of the stenosis, rather than medical therapy, becomes necessary. 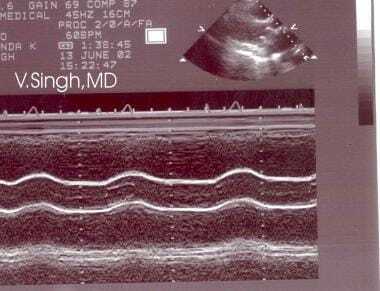 Echocardiography generally provides sufficiently detailed images of the mitral valve and is the most important diagnostic tool in establishing the diagnosis. [12, 13, 14] Doppler echocardiography is used to accurately depict the severity of mitral stenosis. Typical 2-dimensional (2D) echocardiographic findings include thickening of the mitral valve cusps; enlargement of the LA, with a normal or small LV; and a reduction in the size of the mitral valve orifice in diastole. A diminished E-F slope is noted on M-mode images. Doppler studies demonstrate an increase in the mean pressure gradient across the mitral orifice; Doppler studies are also helpful in quantifying the severity of mitral stenosis. 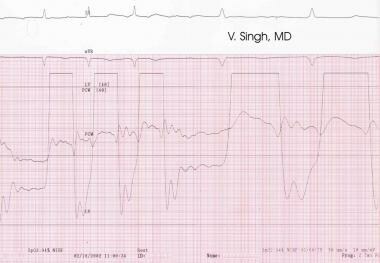 If the patient is in sinus rhythm, the electrocardiogram shows abnormality of the LA. LA abnormality is manifested by prolongation of the P wave, with a double-saddleback contour (p mitrale) in limb lead II. This contour represents a right atrial p wave followed by delayed LA P wave associated with an enlarged left atrium. LA abnormality is seen as a terminal negative deflection following the initial upright p wave in the chest lead V1. The main rhythm is usually sinus in the beginning. However, atrial fibrillation increases in frequency as mitral stenosis advances. If pulmonary arterial hypertension has developed, electrocardiography may show signs of RV hypertrophy. Each of these 4 features is then graded on a scale of 1-4, with the different grades representing minimal, mild, moderate, and severe involvement, respectively. The highest total possible score is 16. A score of 8 or less indicates high probability that balloon mitral valvuloplasty will be successful. Percutaneous balloon mitral valvotomy is the procedure of choice for patients who have symptomatic, hemodynamically severe stenosis and whose echocardiographic score is 8 or less and who are without LA thrombus. A score of 8 or less is generally associated with excellent immediate and long-term results. For patients with scores exceeding 8, the results are less impressive; in such patients, there is a risk of mitral regurgitation. For patients with mitral stenosis, the chest radiograph may exhibit certain specific and nonspecific findings that are generally a consequence of left atrial enlargement, mitral calcification, pulmonary hypertension, and congestive heart failure (CHF). The degree of confidence is reasonably good for mitral stenosis. Findings are sometimes nonspecific. The characteristic radiologic finding of mitral stenosis is selective left atrial enlargement. An enlarged left atrial appendage, as shown by convexity at the left upper cardiac border just below the left main bronchus, suggests a rheumatic etiology. Generalized left atrial enlargement, particularly on the anteroposterior chest radiograph, alters the left border of the cardiac silhouette so that it becomes straight, in contrast to the usual mild concavity evident beneath the pulmonary artery shadow. A double contour or double convexity may be discernible along the right cardiac border. On the lateral chest radiograph, an enlarged LA is seen as posterior displacement of the upper cardiac border inferior to the tracheal bifurcation. In fact, a lateral chest radiograph obtained during a barium swallow study may show a large left atrium impinging on the esophagus and displacing it backward and to the left, in contrast with its usual rightward displacement. Severe LA dilatation may cause aneurysmal enlargement; in addition, the left atrium approaches within a few centimeters of the chest wall on 1 or both sides, as seen in long-standing mitral regurgitation with atrial fibrillation. The LV is usually not enlarged in cases of isolated mitral stenosis unless there is clinically significant mitral regurgitation. Calcification may be detectable on the plain radiograph. It may be either in the wall of the left atrium or in a blood clot lining the atrial wall. This kind of calcification appears as a curvilinear structure lying fairly high on the cardiac silhouette. Fluoroscopy may be used to identify dystrophic calcification in the mitral valve cusps in patients with long-standing rheumatic heart disease. Mitral annular calcification (MAC) may appear in the shape of an ellipse, usually open medially in a J, U, or horseshoe shape. In addition to causing mitral stenosis, the dense calcification may interfere with valve closure and cause mitral regurgitation. In the presence of pulmonary arterial hypertension, the main pulmonary artery and central pulmonary vessels appear enlarged, with pruning of the peripheral vessels. Mitral stenosis causes pulmonary venous hypertension that appears as increased vascularity on chest radiographs. Selective blood diversion to the upper lobes distends upper-lobe veins and constricts lower-lobe veins. Kerley septal costophrenic B lines represent interstitial edema. Pulmonary alveolar edema may appear as confluent pulmonary shadows present mainly in the perihilar region. The edematous interlobular septa of the lungs may be identified on the chest radiograph as opaque lines of different lengths, depending on their location. Kerley first described these lines, designated A, B, and C, which are known as Kerley lines. A lines are 5 to 10 cm long and are nonbranching; they fan radially upward and outward from the pulmonary hilum. B lines are best seen in the lower lung zones, perpendicular to the pleural surface; these are shorter than 2 cm. The combination of A and B lines creates a reticular pattern, called C lines, that are transient and difficult to visualize. All of the Kerley lines represent edematous interlobular septa. The pulmonary lobules tend to be large and are oriented obliquely to the pleura in the upper lobes, whereas in the lower lobes, they are shortened and are perpendicular to the pleural surface. This feature results in the characteristic appearance of the B lines, which are the ones most readily identified on the chest radiograph. Pulmonary hemosiderosis develops in long-standing mitral stenosis and pulmonary hypertension. It is seen on the chest image as fine punctuate opacities throughout the lungs. They may also occur as recurrent hemorrhages seen as iron-containing deposits in the pulmonary tissue. Pulmonary ossified nodules, defined as multiple discrete calcified opacities of up to 10 mm in diameter, may be seen at the bases of the lungs as well. CT scans occasionally depict calcification in the enlarged LA in patients with mitral stenosis. It may be seen to occupy the wall of the atrium, or it may appear within a thrombus attached to the wall. Whenever calcification is observed in the atrial appendage, it generally indicates associated mitral stenosis. Calcification in the wall of the atrium or in the appendage is usually considered an unfavorable prognostic sign. For patients with mitral stenosis, MRI may be helpful if Doppler echocardiographic findings are insufficient or are inconsistent with clinical data. [18, 19] This problem occurs in approximately 10% of patients because of air-tissue attenuation of ultrasound. MRI is often used in cases in which there is associated complex congenital heart disease because of its 3-dimensional (3D) capabilities and high resolution. MRI is of limited use in patients with atrial fibrillation, a common finding in mitral stenosis. Irregular rhythm may be a potential source of error in the measurements. With recent technological advances in magnetic resonance (MR) computer technologies, many pulse sequences may now be used for cardiac MRI. The 2 main types of pulse sequences are dark-blood techniques and bright-blood techniques. With dark-blood techniques, such as spin-echo (SE) and fast SE (FSE), fast flowing blood appears black and hypointense; dark-blood techniques are useful for delineating the structure of cardiac chambers and the lumina of blood vessels. In contrast, the bright-blood techniques, such as gradient-recalled echo sequences (GRE), depict flowing blood as white and hyperintense. Bright-blood techniques are useful for determining gradients and flows. Imaging planes for MRI of the thorax are the 3 orthogonal planes: transverse, sagittal, and coronal. Because the cardiac axes are not parallel to the axes of the body, planes parallel and orthogonal to cardiac axes (ie, the short and long axes of the heart) are used for cardiac imaging. For the mitral valve in particular, a long-axis view of the mitral valve is obtained through the LV apex and the outflow tract for a 5-chamber view. ECG-gated multisection SE and FSE MRI usually demonstrates thickening and bulging of the leaflets of the mitral valve. It may also show the sizes of the chamber, particularly in cases involving an enlarged left atrium and a normal-size left ventricle. Cine MRI is performed by using GRE pulse sequences at multiple phases of the cardiac cycle. These may be used to determine the degree of mitral stenosis on the basis of the size and extent of the abnormal flow jet during diastole. The best planes for obtaining the signal void representative of the abnormal flow jet are the 4-chamber view and the coronal oblique plane, displaying the left atrium and the left ventricle. With the help of velocity-encoded cine MRI, the maximum velocity of the mitral stenotic jet may be calculated on planes perpendicular and parallel to the direction of the flow. This velocity value may then be used in the modified Bernoulli equation (gradient = 4 X velocity2) to determine the gradient across the stenotic mitral valve. 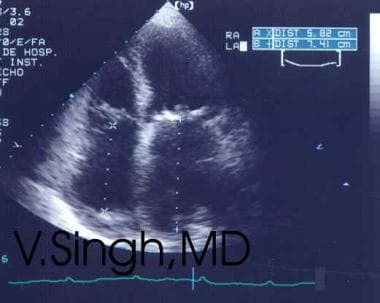 Prosthetic mitral valve in a patient with mitral stenosis, as demonstrated with 2-dimensional echocardiography. Two-dimensional (2D) echocardiogram (apical 4-chamber view) in a 29-year-old patient with rheumatic mitral stenosis and mitral regurgitation shows fusion of commissures and vegetation. The echocardiogram was taken after the patient was hospitalized with sepsis (subacute bacterial endocarditis). In patients with mitral stenosis, characteristic findings on 2D echocardiography include thickening and reduced mobility of anterior and posterior mitral leaflets, with predominant involvement of the commissures, especially in cases of rheumatic mitral stenosis. In advanced mitral stenosis, substantial calcification occurs within the leaflet and the subvalvular tissues, including the chordae tendineae and the papillary muscles. Leaflet motion at the tips is decreased in the beginning, sparing the body and leading to the characteristic doming of the mitral valve seen on 2D echocardiograms. The anterior leaflet assumes a hockey-stick appearance. The actual restrictive orifice of the mitral valve may be planimetrically measured in a parasternal short-axis view. In the M-mode, the thickened leaflets may be seen. Because of their limited mobility, flattening of the E-F slope is observed; the degree of flattening may be used to calculate the severity of mitral stenosis. Both continuous-wave and pulsed Doppler echocardiography may be performed with the patient at rest and during exercise to quantitate the transmitral gradient. The pressure half-time (T½) is the time in milliseconds required for the peak pressure gradient to decline to one half of its original value. T½ may be calculated as follows: Mitral valve area = T½ ÷ 220 milliseconds. This relationship may be yield somewhat inaccurate results in patients who recently underwent balloon mitral valvotomy or in patients with concomitant mitral regurgitation, aortic insufficiency, or decreased LV diastolic function. The continuity equation for calculating the area of the mitral valve involves the determination of quantitative mitral valve flow; the equation is as follows: A 1(V 1) = A 2(V 2), where A 1 is area 1, A 2 is area 2, V 1 is velocity 1, and V 2 is velocity 2. Flow and dimensions at the level of the mitral valve annulus or forward flow in the LV outflow tract may be used in this equation. Regurgitation or multivalve disease may make the calculations inaccurate. LA dilatation is seen in mitral stenosis. With stasis of blood flow, especially in the presence of atrial fibrillation, intramural or intra-appendage thrombus formation may be seen as an echogenic mass. These findings are best delineated with TEE. The most common clinically significant sequela of mitral stenosis is secondary pulmonary hypertension with subsequent right-sided heart dysfunction and tricuspid regurgitation. The tricuspid regurgitation jet may be measured, and the value may be substituted into the Bernoulli formula to determine the PA systolic pressure. The pressure gradient is calculated as 4 V2, where V is the velocity jet measured in centimeters on the Doppler echocardiograph. The degree of confidence is high. However, echocardiography has specific limitations. Because ultrasound is not transmitted well through calcified structures or bone, an appropriate acoustic window is necessary for optimal visualization. In adults, a noncalcified window must be obtained; this is typically done via the intercostal spaces or from the subxiphoid positions. In patients with narrow intercostal spaces, imaging may be suboptimal. A greater limitation is the degree to which the air-filled structures reflect ultrasound. In patients with obstructive lung disease, intervening lung tissue may cause suboptimal or inadequate imaging results as well. Cardiac catheterization is usually unnecessary for assessing the severity of mitral stenosis. Nonetheless, coronary arteriography is performed in many patients with mitral stenosis who are in an age group in which there is a relatively high incidence of coronary disease and for whom heart surgery is anticipated or who have coexistent angina. In such cases, left- and right-sided heart catheterizations are performed to evaluate the coronary arteries, to confirm the transmitral gradient, and to determine the valve area. The valve area is determined by use of the Gorlin equation: Mitral valve area = [CO(DFP X HR)]/37.6 X h½), where CO is cardiac output (in milliliters per minute), DFP is the diastolic filling period, HR is the heart rate, and h is the mean gradient (see the image below). Pulmonary capillary wedge pressure (PCW) and left ventricular (LV) end-diastolic pressure (LVEDP) gradient seen during cardiac catheterization. Careful clinical evaluation and noninvasive assessment, particularly with 2D and Doppler echocardiography, may provide sufficient information to permit an informed decision for the majority of patients. Critical narrowing of 1 or more coronary vessels occurs in approximately 25% of all adults with severe mitral stenosis. This finding is most common in men older than 45 years who have angina and who have risk factors for coronary artery disease. Angiocardiographic findings in Lutembacher syndrome are similar to those in atrial septal defect. Other signs that may aid in the diagnosis include the following: enlargement of the RA and RV, as well as enlargement of the pulmonary artery; re-opacification of the right side of the heart after left-sided opacification; and dilution in the RA in the presence of a large shunt. Homler H. Valvular heart disease. N Engl J Med. 1997. 337(20):1474-5. Otto CM. Valvular Heart Disease. Philadelphia: WB Saunders;. 1999: 261. Bruce CJ, Nishimura RA. Clinical assessment and management of mitral stenosis. Cardiol Clin. 1998. 16(3):375-403. [Medline]. Fassbender D, Schmidt HK, Seggewiss H, et al. Diagnosis and differential therapy of mitral stenosis. Herz. 1998. 23(7):420-8. Kimura M, Iwase M, Nagasaka A, et al. Relationship between mitral valve echo score and hemodynamic variables in patients with mitral stenosis. J Cardiol. 1998. 31 Suppl 1:53-9. Krishnamoorthy KM, Radhakrishnan S, Shrivastava S. Left atrial and pulmonary artery wedge pressure monitoring during balloon mitral valvuloplasty. J Assoc Physicians India. 2001 Jun. 49:614-6. [Medline]. Oliaro E, Orzan F, Mangiardi L, Trevi GP. The functional assessment of mitral stenosis. Minerva Cardioangiol. 2001. 49(2):115-26. Thomas G. Is mitral valve area estimation a sine qua non in the evaluation of mitral stenosis?. J Assoc Physicians India. 1998. 46(6):579-80. Shivaram P, Ahmed MI, Kariyanna PT, Sabbineni H, Avula UM. Doppler echocardiography imaging in detecting multi-valvular lesions: a clinical evaluation in children with acute rheumatic Fever. PLoS One. 2013 Sep 17. 8(9):e74114. [Medline]. [Full Text]. Bilen E, Sari C, Durmaz T, Keles T, Bayram NA, Akçay M, et al. The Importance of Echocardiography in Transcatheter Aortic Valve Implantation. Echocardiography. 2013 Sep 12. [Medline]. Helvacioglu F, Yildirimturk O, Duran C, Yurdakul S, Tayyareci Y, Ulusoy OL, et al. The evaluation of mitral valve stenosis: comparison of transthoracic echocardiography and cardiac magnetic resonance. Eur Heart J Cardiovasc Imaging. 2013 Sep 11. [Medline]. de Agustin JA, Mejia H, Viliani D, Marcos-Alberca P, Gomez de Diego JJ, Nuñez-Gil IJ, et al. Proximal flow convergence method by three-dimensional color Doppler echocardiography for mitral valve area assessment in rheumatic mitral stenosis. J Am Soc Echocardiogr. 2014 Aug. 27 (8):838-45. [Medline]. Jain S, Mankad SV. Echocardiographic assessment of mitral stenosis: echocardiographic features of rheumatic mitral stenosis. Cardiol Clin. 2013 May. 31 (2):177-91. [Medline]. Motiwala SR, Delling FN. Assessment of mitral valve disease: a review of imaging modalities. Curr Treat Options Cardiovasc Med. 2015 Jul. 17 (7):390. [Medline]. Wilkins GT, Weyman AE, Abascal VM, et al. Percutaneous balloon dilatation of the mitral valve: an analysis of echocardiographic variables related to outcome and the mechanism of dilatation. Br Heart J. 1988 Oct. 60(4):299-308. Cook C, Styles C, Hopkins R. Calcification on the chest X-ray: a pictorial review. Hosp Med. 2001. 62(4):210-3. Kim SS, Ko SM, Song MG, Chee HK, Kim JS, Hwang HK, et al. Quantification of stenotic mitral valve area and diagnostic accuracy of mitral stenosis by dual-source computed tomography in patients with atrial fibrillation: comparison with cardiovascular magnetic resonance and transthoracic echocardiography. Int J Cardiovasc Imaging. 2015 Jun. 31 Suppl 1:103-14. [Medline]. Rocha P, Qanadli SD, Strumza P, et al. Brain "embolism" detected by magnetic resonance imaging during percutaneous mitral balloon commissurotomy. Cardiovasc Intervent Radiol. 1999. 22(1):7-12. Wyttenbach R, Bremerich J, Saeed M, Higgins CB. Integrated MR imaging approach to valvular heart disease. Cardiol Clin. 1998. 16(2):277-94. Assi ER, Tak T. Assessment of valvular heart disease. Why echocardiography is an essential component. Postgrad Med. 1998. 104(6):99-110. Chammas E, Khoury J, Ghanem G, et al. Value of transesophageal echocardiography in the diagnosis of peripheral embolic event. J Med Liban. 1998. 46(4):194-8. Faletra F, Pellegrini A. The echocardiographic assessment of mitral stenosis. Cardiologia. 1998. 43(2):121-8. Hecker SL, Zabalgoitia M, Ashline P, et al. Comparison of exercise and dobutamine stress echocardiography in assessing mitral stenosis. Am J Cardiol. 1997. 80(10):1374-7. Mezilis NE, Salame MY, Oakley GD. Predicting mitral regurgitation following percutaneous mitral valvotomy with the Inoue balloon: comparison of two echocardiographic scoring systems. Clin Cardiol. 1999. 22(7):453-8. Mittal SR, Goozar RS. Echocardiographic evaluation of right ventricular systolic functions in pure mitral stenosis. Int J Card Imaging. 2001. 17(1):13-8. Nimura Y. Heart valves and cardiac ultrasound: historical perspectives. J Cardiol. 1998. 31 Suppl 1:3-18. Oku K, Utsunomiya T, Mori H, et al. Calculation of mitral valve area in mitral stenosis using the proximal isovelocity surface area method. Comparison with two-dimensional planimetry and Doppler pressure half time method. Jpn Heart J. 1997. 38(6):811-9. Padial LR, Abascal VM, Moreno PR, et al. Echocardiography can predict the development of severe mitral regurgitation after percutaneous mitral valvuloplasty by the Inoue technique. Am J Cardiol. 1999. 83(8):1210-3. Shiran A, Goldstein SA, Ellahham S, et al. Accuracy of two-dimensional echocardiographic planimetry of the mitral valve area before and after balloon valvuloplasty. Cardiology. 1998. 90(3):227-30. Takuma S, Homma S. Evaluation of mitral valve disease using transesophageal echocardiography. Semin Thorac Cardiovasc Surg. 1998. 10(4):247-54. Selamet Tierney ES, Graham DA, McElhinney DB, Trevey S, Freed MD, Colan SD, et al. Echocardiographic predictors of mitral stenosis-related death or intervention in infants. Am Heart J. 2008 Aug. 156(2):384-90. [Medline]. Popescu BA, Jurcut R, Serban M, Parascan L, Ginghina C. Shone's syndrome diagnosed with echocardiography and confirmed at pathology. Eur J Echocardiogr. 2008 Jul 11. [Medline]. Chu JW, Levine RA, Chua S, Poh KK, Morris E, Hua L, et al. Assessing Mitral Valve Area and Orifice Geometry in Calcific Mitral Stenosis: A New Solution by Real-time Three-Dimensional Echocardiography. J Am Soc Echocardiogr. 2008 Jul 11. [Medline]. Pirat B, Yildirir A, Simsek V, Ozin B, Muderrisoglu H. The effect of leg lifting on tissue Doppler parameters in severe coronary artery disease. Scand Cardiovasc J. 2008 Mar 4. 1-6. [Medline]. A 12-lead ECG in a patient with mitral stenosis shows evidence of left atrial enlargement (inverted distal portion of P wave in lead V1 and elongated P wave in lead II), along with increased right heart forces consistent with pulmonary hypertension and right ventricular (RV) overload. 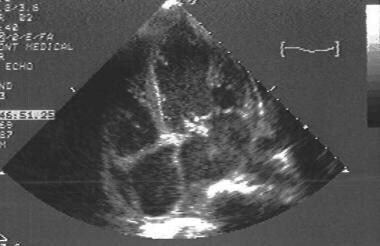 M-mode echocardiogram in a patient with moderate mitral stenosis (calcific) shows evidence of multiple echoes of the anterior mitral leaflet; this finding suggests thickening and calcification. Patients with malar flush, or florid countenance, have pinkish-purple patches on their cheeks.